Play Donkey Kong 3 Now! Donkey Kong's loose in the greenhouse and only Stanley the bugman can stop him. Armed with a can of bug repellant, Stanley must work furiously to keep Donkey Kong and all of the Buzz Bees and Bee Spies away from his flowers. Get the super spray and you can blast your way through three screens full of greenhouse excitement. Finally a change from the original, with the addition of a new character. Donkey Kong 3 was a pretty fun game. The only thing that isn't so great about it was the controls. I mean, do we really need two buttons for shoot? One of them could have been jump, instead they made it where up is jump. 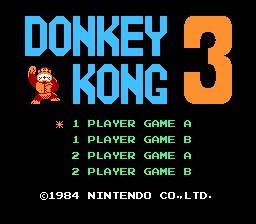 A good game all around, Donkey Kong 3 is a must play for any Donkey Kong fan. Stanley must shoot insect repellent at Donkey Kong to drive him to the top of the screen while avoiding or shooting insects. He must protect five plants that are at the bottom of the screen from being carried off by the various insects. Always be sure to pick these up when they fall, you will beat the level a lot faster with a better weapon.